Exceeding your data allowance can result in additional charges. To stay in control you can quickly and easily set limits and monitor how your data is being used on your device. 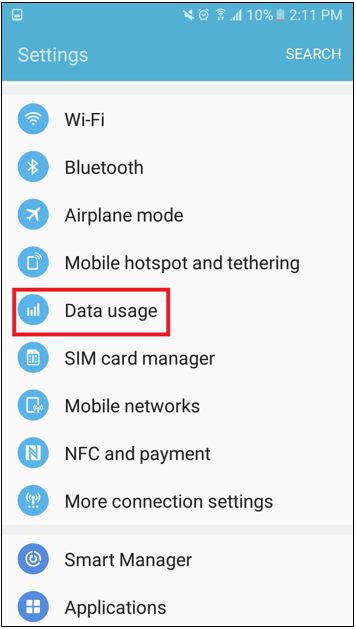 Under the “Data usage” settings of your device, all App related data usage is recorded, allowing you to track exactly how your data is being used. Step 1. 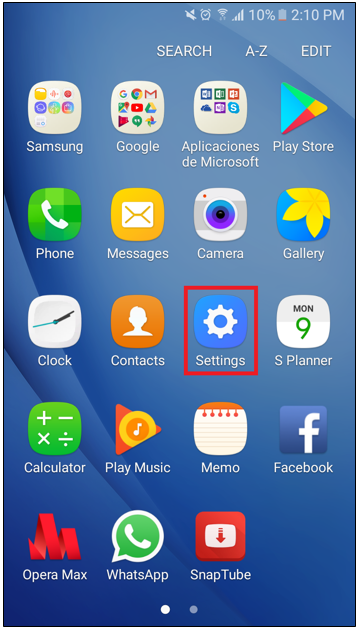 From your Android home screen, app drawer, or notification panel, tap the gear shaped icon to open your device’s Settings menu. Step 2. Select “Data Usage” This will open the Data Usage screen. The screen will then display the overall amount of data used at the top and below in a graph. Step 3. 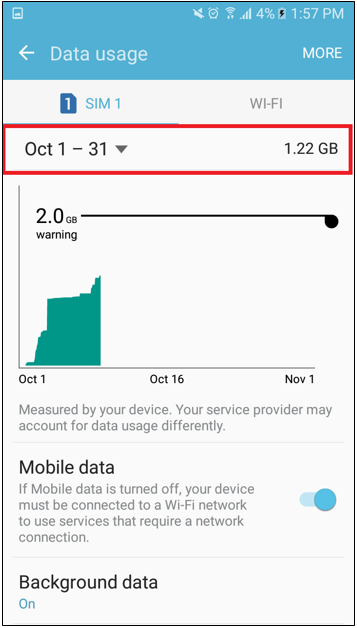 Select “Mobile Data Usage” to check the overall data amount you've used for a certain period. Enter the period from which you would like to check your data usage using the drop down box at the top right corner of the screen then tap “OK.” The changes will be displayed at the top of the screen. Note: Your Android device will not automatically line the dates up with your monthly billing cycle, so you’ll need to set your billing date manually. Step 4. Below the overall data amount used, you will see a list of applications is displayed. 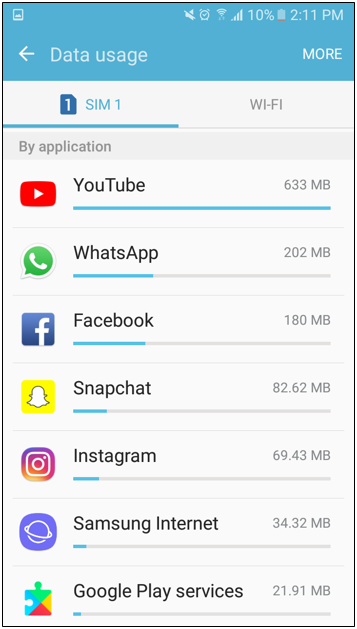 This list shows the amount of data used individually by each app. Step 5. Select an application to check the specific amount of data used. Step 1. After going to Settings, select 'Connections'. Step 2. Select 'Data Usage'. Step 4. Select 'Billing Cycle'. Step 5. Turn the 'Data Limit' on so the data will be turned off when the limit is reached. Step 6. Set your data limit by clicking 'Data Limit'. 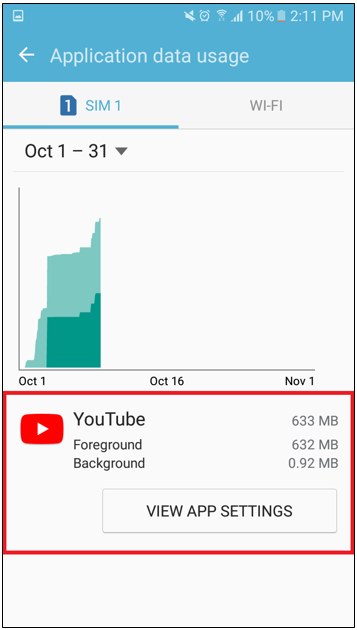 Enter the amount of data you would like your device to use before it turns off data usage. Step 1. Go into 'Settings'. Step 3. 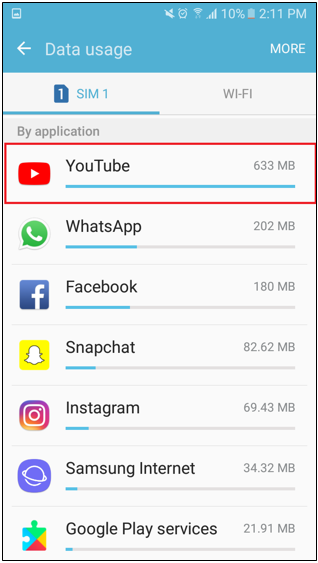 Scroll down to view data usage data usage per App and for the current period. Scroll further down to view the beginning date of your current period. Step 1. After going to Settings, select 'General'. Step 2. Turn on 'Restrictions'. Step 3. You will be prompted to set a password. Step 4. Scroll down to 'Cellular Data'. Step 5. Select 'Don't Allow Changes' for both Cellular and Cellular Plan.